Designer furnished luxurious beachfront villa. Located at Ko Olina's 2nd Beach Lagoon. Furnished beautifully with 1 king bed, 1 queen bed, 2 twin beds and a sofabed. The 2 Twins can be Made into a King Bed. Attention to detail is evident. 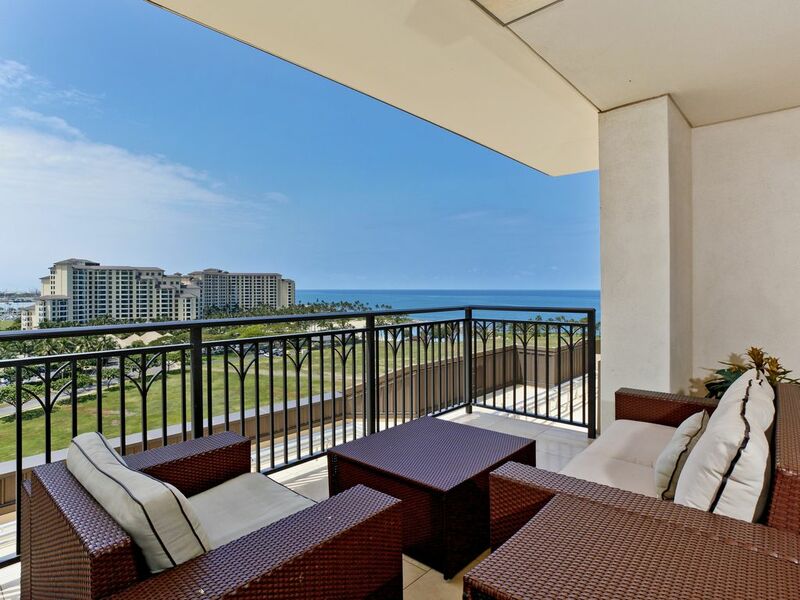 This high floor Penthouse Villa has beautiful Ocean views and golf course views. This Villa is furnished in a tasteful and elegant decor. It has central air, ceiling fans and all the amenities. It has a 2 huge lanais and 1 smaller lanai. 3 bedrooms, 3 FULL BATHS, living room, dining area, full kitchen designed by Chef Roy Yamaguchi, and Bosch washer/dryer. Fully equipped with state-of-the-art electronics package with stereo system. Choose to spend your days on the Ko Olina Championship golf course or at the Marina; relax at one of four breathtaking sandy lagoons, pamper yourself at the award winning Four Seasons Resort and Spa; spoil the kids at Au'lani Disney Resort or explore the rich culture and beauty of the Island. Enjoy breath-taking sunsets, experience an authentic Hawaiian luau, a barbeque by the pool or a relaxing evening stroll through beautiful Ko Olina. World-class restaurants and nightlife are only minutes away in the laid-back, serene atmosphere of Ko Olina - or experience all the excitement of city life with a drive to Honolulu. Public transportation and limousine service are both available from Ko Olina. Activities: Ko Olina Marina; 18-Hole Ted Robinson Championship Ko Olina Golf Course; Award-Winning Four Seasons full service Spa, Disney Au'lani , the Paradise Cove Luau, shopping, snorkeling, SCUBA diving, boating, fishing, sailing, surfing, windsurfing, walking and hiking paths; guided activities, including whale watching and dolphin swims as well as scenic island tours. Area: This romantic yet family-friendly resort is located just 20 to 30 minutes from Honolulu International Airport, world-famous Waikiki, downtown Honolulu, Pearl Harbor, Waikele Premium Outlets and other attractions such as Historic Ewa Town, Hawaii's Plantation Village, and Dole Cannery. Breath-taking Hanuama Bay is a 45 minute drive with Sea Life Park a short 5 minutes further. The Polynesian Cultural Center is well worth the hour's drive and you'll experience many traditional must-sees along the way - such as the historic surfing town of Haleiwa, and Hawaii's infamous North Shore Beaches such as Sunset, Pipeline and Turtle Beach to name a few. The resort itself is home to the island's best and most authentic luau - Paradise Cove. Hawaiian Waters Adventure Park; Kapolei's 16-plex movie theater, and shopping at K-Mart, Wal-Mart, Target, Safeway and Costco for souvenirs and all your needs is just a short drive. View more about Ola Properties, Inc. This kitchen was designed by world-famous chef Roy Yamaguci. It is perfectly suited for your own culinary inclinations with a large island, a wine chiller and plenty of counter space. This unit is perfectly suited for guests who want the freedom to cook meals and live with all the comforts of home. Guests will also be able to chill their wine in a spacious win cooler located in the kitchen. Very nice accommodations overall. Had some roaches and ceiling fan in Master Bedroom did not work. Everything else was excellent!